I recently updated my server from SBS 2003 to SBS 2008. I also updated my laptop to Windows 7. When I went to configure my Outlook 2007 of the laptop for RPC over HTTP, now called Outlook Anywhere - I was not able to do it! 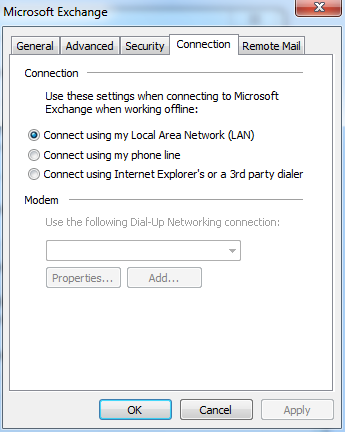 And the reason I was not able to do it was that the option and checkbox to enable Outlook Anywhere were NOT THERE in the GUI. Here's a screen shot of what I had and one of what I should have had. I looked all over and did a lot of internet searches but could not find any clues on this. Finally I went to the Microsoft Partner private newsgroups and Wind Ying provided a quick response that did the trick. I made the change to 1 and voila - fixed.